Heritage piglets, heirloom seeds. Happy Easter! Though we have not slept in for eleven years (kids) our morning started more gradually than it should have. Mr. Pink Guitar ran a hay/mulch errand, meeting up with Farmer Joe, one of our kindest farmer friends who offered to give us rotten hay rolls for the garden. Free mulch, what’s not to love about that? Mr. Pink Guitar indicated that he would do chores when he got back, so the rest of us drifted around sleepily making breakfast, reading and starting seeds. Mr. Pink Guitar must have spent a lot of time shooting the breeze with Joe (who is a wonderful conversationalist and oozes wisdom) because it seemed like hours before he got back. We’d finally decided to start chores just as the big ranch truck rumbled up the drive, trailer laden with hay in various states of decomposition. Sophie left the house and wandered off to the barn right after the truck pulled up. Soon after I heard her scream, when I looked out the window she was running, arms flailing towards the truck. I got my muck boots on quickly, mentally prepared to face something terrible. Roselle had farrowed, but what should have been a joyous occasion became somber as the situation revealed itself. 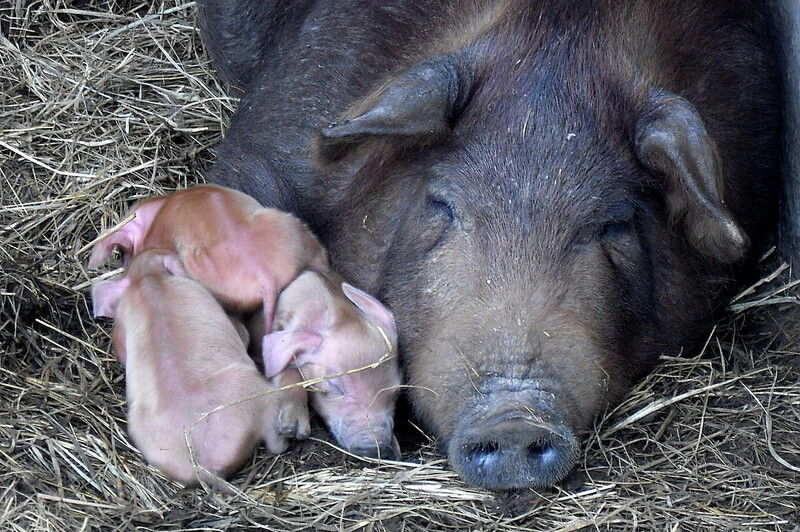 Roselle was not showing interest in her piglets and had crushed two. Two more had not made it through the birthing process. We counted six tiny piglets skinny and shivering huddled in the corner, ignored. We tried to put a heat lamp on them and Roselle freaked. Well, at least she was being protective. There were a lot of hushed comments about letting nature take its course and leaving the new mom alone. Because it was Roselle’s maiden voyage into motherhood, we needed to give her a break, and the birthing conditions were not ideal. We had wanted her to farrow out in the woods separated, but comfortably close to her herd the best way for a gilt/sow to farrow in our humble opinion. 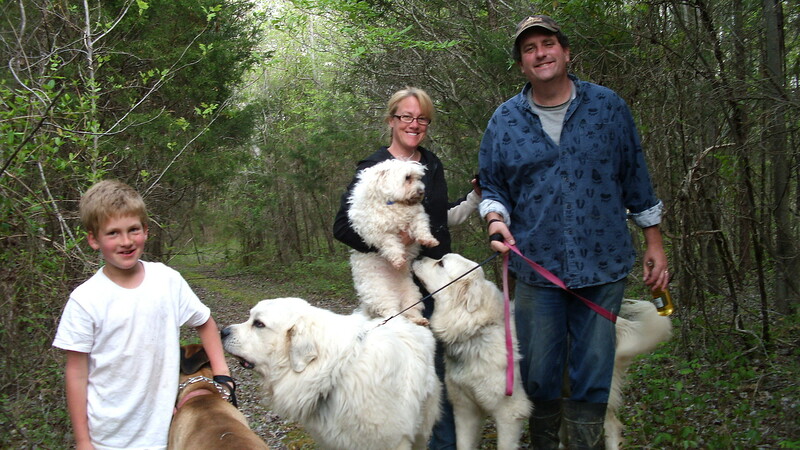 But Roselle had become Houdini and would be held in by NO pen, maybe she wanted to range with the chickens, but with babies on the way, we didn’t want her nesting in the woods somewhere – way out there. We put her in the barn (well, actually she walked right in because that’s where she was hanging around) two weeks ago, in a horse stall, ousting our calf; and with fasteners, clips, hog panels, power tools and stall mats, we were able to keep her contained. The critical time for piglets or any newborn is the first 24 hours, the piglets needed colostrum and warmth and if they made it three days we figured we could announce with confidence the arrival of 6 purebred heritage Red Wattle piglets. Update: Roselle has calmed down and is taking wonderful care of her babies, they are all fat and sassy. She just needed some time to figure things out and get used to the idea that it is not all about her right now. She does still like her “me” time a little more than the other sows seemed to. 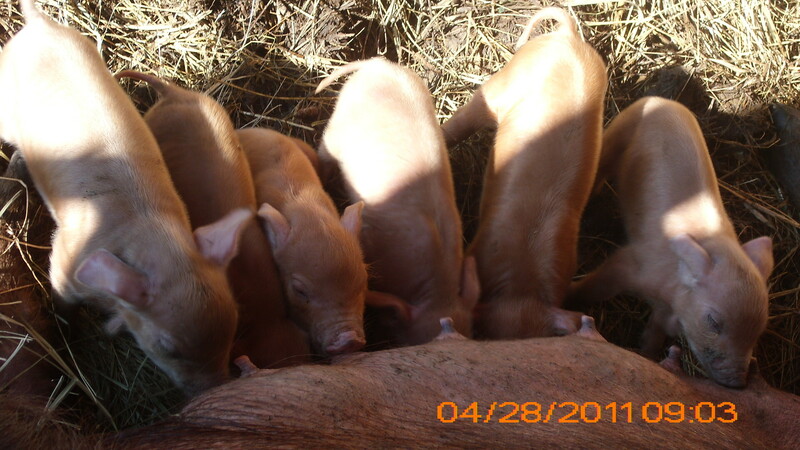 However, all is well in piglet world with 5 females and 1 sturdy male, who nurses at first position. One piglet had an injured foot, so we had to do a little doctoring, which gave us an opportunity to cuddle (!) with her. This piglet is a runt and her name is Zinnia. Heirloom seeds are one of the greatest gifts on the planet, at least to me. Great things come in small packages and I love seed packets. I collect them like a pre-pubescent baseball card junkie of olden days hoarding them in boxes and containers; I even turned my wine fridge into a seed vault. So when we got an Easter care-package in the mail from our wonderful friends Bob and Kathy a few days ago we carefully cut the tape and opened the box with rapt anticipation. Care-packages are always exciting. Among the goodies, plastic Easter eggs filled with treats and treasure as well as several thought provoking books “Harvest for Hope, A Guide to Mindful Eating” by Jane Goodall and “The Good Good Pig, the extraordinary life of Christopher Hogwood” by Sy Montgomery. Both authors are vegetarian, one – Vegan. Interesting how I had just come across this article and was pondering the debate about humanely raising animals for food versus the Vegan perspective – all this after watching Food, Inc. I find it’s important to look at all sides of an issue with an open mind. Research and contemplation of an issue so close to home is a much better alternative than ignorance. So what else was in the box? Some nice Easter cards and news clippings with great information about farming and food, mentoring us further along this journey, and last but far from least, was a small innocuous looking bag from the gift shop at the venerable Monticello Estate. 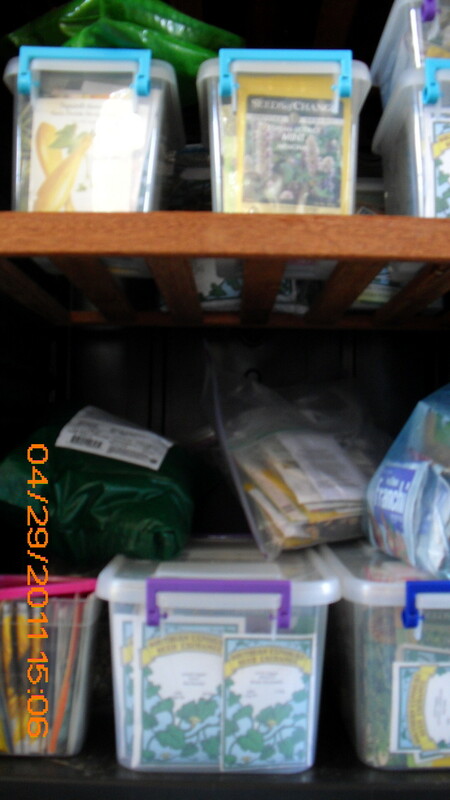 I carefully unfolded the small sack to reveal the most marvelous selections of Heirloom seeds! A cache of 12 historic plant varieties! Cardoon, Prudens Purple tomato, Bloody Butcher corn, Lemon Balm, Early Curled Siberian Kale, Purple Calabash tomato, Fish Pepper, Brown Dutch Lettuce, Sesame, Red Calico Lima Bean, Cow’s Horn Okra, Balsam Apple. WOW! Hey, what’s Balsam Apple? From Packet: “Jefferson planted this tender annual vine along the winding walk flower border on Monticello’s West Lawn in the spring of 1812. The Balsam Apple’s glossy, delicate foliage, small yellow flowers, and bursting orangish red fruit are a curious and unusual addition to the summer flower border. Plant the seed after the last spring frost and provide support with a fence of trellis. The vines will twine to ten feet in a sunny, fertile site”. 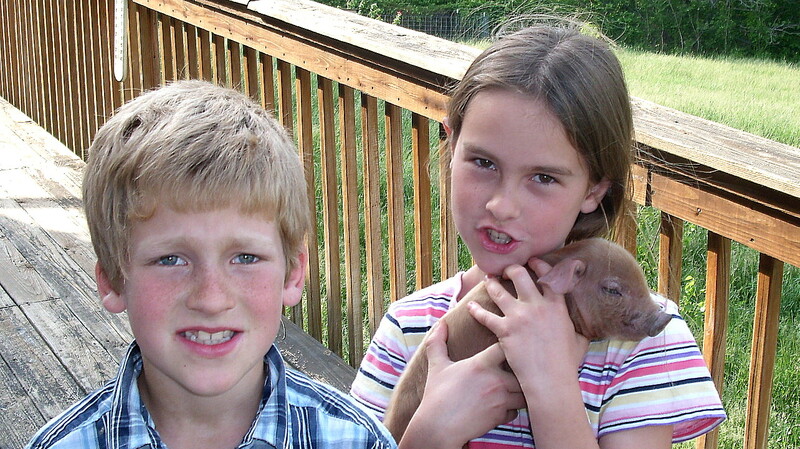 What a wonderful Easter Sunday: heritage piglets and heirloom seeds, it doesn’t get any better than this. We also planted a mini-orchard with 10 fruit trees (orchard now totals 50), moved the chicken coop so our 27 new chicks could be closer to the house and to make room for our 7 Bantams and 6 Pekin ducklings. Reflecting back two years ago exactly, the enormity of our move away from friends and family was sinking in. We had just lost a favorite uncle with no opportunity to say good-bye. We were alone on the holiday and phone calls to loved-ones made the distance more painfully clear. We did the only thing we knew to do, face the future and embrace it, and plant an apple tree in honor of Uncle Wayne. Pinkguitarfarm is in its infant stages. We keep on keeping on against various odds because we have cherished friends who have lent us huge amounts of emotional support, not to mention gifts, seeds, rotten hay, fencing, green house supplies, free pig and bull-calf castrations, community endorsements, wagon rides, songs and music, wisdom, social invitations, articles, links, books, mentoring, care packages, a skype camera, visits, wine and late night conversations. We have farmers market customers that try our vegetables and recipes even though the vegetables and recipes might seem weird, and those that buy our fabulous pork. Thank you for being a part of this crazy adventure!